Here’s a very concise look at how to be effective — or not! — at intelligent debate. The graphic is based on How to Disagree by Paul Graham, which is well worth reading. The most convincing form of disagreement is refutation. It’s also the rarest, because it’s the most work. Indeed, the disagreement hierarchy forms a kind of pyramid, in the sense that the higher you go the fewer instances you find. This entry was posted in Politics in Practice. Bookmark the permalink. Ah, if someone could, somehow, convince most of the folks that comment on the various internet threads to read this book. Perhaps then it would be interesting to read more of them. 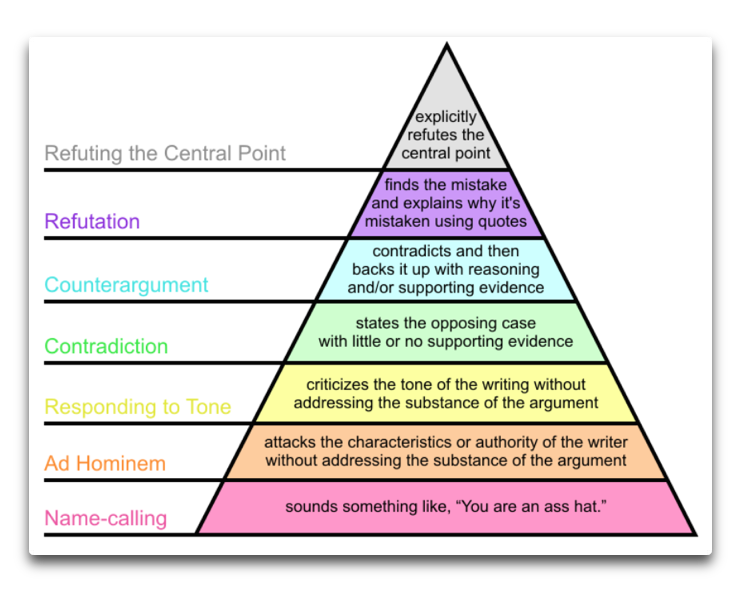 As it is, all too many stop at the lowest level of the above pyramid “Name-Calling” and most of the remainder stop at the next level “Ad-Hominem” and intelligent discussion is almost lost. I end up not being able to read much of the threads, unless the thread is quite short, because my mind has to have time to recover from the blunt trauma wounds inflicted. I reblogged the article just for the pyramid graphic alone. I’m sure it’s nothing compared to the book it came from, but it’s still a great thumbnail concept to understand. I’ve never taken any courses in rhetoric, logic, debate, or even philosophy. Academically, I’m a one-dimensional engineer. 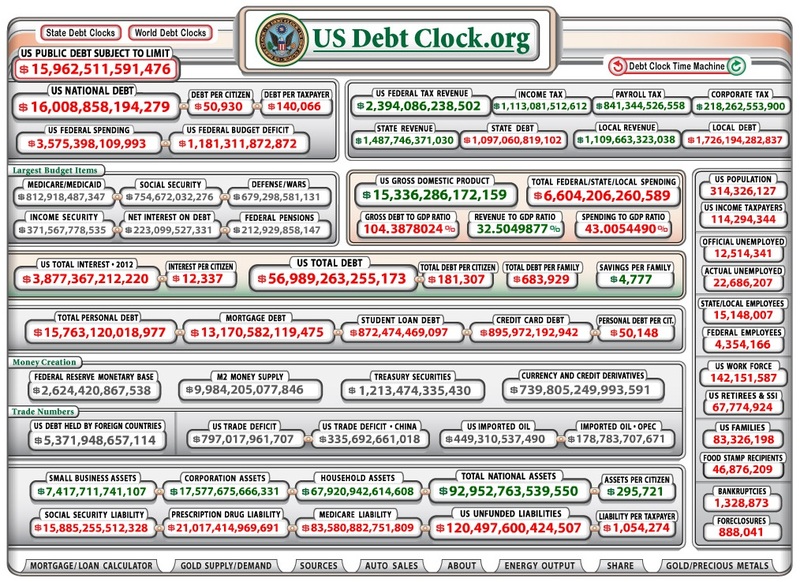 But in the last 3-ish years here I’ve come to appreciate that there is a structure to debate. Some approaches work better than others, and it’s a multi-player sport that’s best played by some basic guidelines. I once participated in a month-long round robin comment marathon, where each long-winded participant essentially felt they had to get the last word (including me). It became exhausting, and I eventually brought it to a train wreck myself by working my way down to the ground floor of that pyramid. My ego wouldn’t let me concede, but my stamina was gone, so I put sugar in the gas tank to kill the engine rather than let someone else drive the car away. I lost a couple internet friends (two of the blog’s admins) over it. All I learned from it was how NOT to interact in social media. Seeing that pyramid graphic gave me an uncomfortable déjà vu. Jeff, my father was an electrical engineer and in October of 1964 he told me: Unless you honestly look at both sides of an issue you don’t have an opinion, you are a parrot. Another saying of his was: If the refrigerator is broken, changing the tires on your car won’t help. His training and experience as an engineer helped him with political problems. I am a retired electronics technician and my training and experience has helped me in that regard as well. Using logic and problem solving skills in political thought works much better than emotional thought. And far too many people do not try to use logic in politics. We all need to learn the art of disagreeing. It really does take more work and time. Yes it does take time. My favorite approach with my essays is to not simply assert my position but also pre-refute the first round of likely responses. Beyond just hitting the nail on the head, I guess you could say I’m trying to pound the nail all the way in with the first blow so it can’t be pulled back out. As a consequence, I don’t post very often. It also means that I have a hard-disk folder with several dozen partially-finished articles because I have ideas for additional research to invest in them, but weeks go by without sufficient time to carry it through. And I’m incurably stubborn about it. Sometimes I just want to air my opinion, sometimes I just want to rant But it always takes much longer to write a fully researched informed opinion. I don’t always take the time…unless I’m writing a comment at your blog! When I post a rant, or comment on a thread, or engage in a discussion I will often take a position that I do not agree with just to see where the discussion will go. I want to get people thinking even if, or perhaps especially if, they don’t agree with me. It sounds like you prefer 3-D chess, while I’m laboring to master tic-tac-toe. When you post a comment that takes a position that you don’t agree with, do you say something like “for argument’s sake…” or “playing devil’s advocate…” ? No, I give no warning about the level of my belief since I am out to provoke thought and thus do not want to contaminate the process. However, if I take a position and continue to hold it for a long period of time or I later point out that this is my position then you can be sure that it is indeed my position and not a line for a discussion. Be as watchful as you wish concerning my comments. But give them honest thought. Remember, I want to provoke thought not mindless argument. I feel the need to tell everyone that you own the all-star award for the #1 best comment on my blog, ever. Well, I don’t think that was the best comment on your blog. I’m not even sure I got my meaning through in all of those words. But at least, I knew what I meant! And it was from personal experience which to me is important in what we believe. Thanks so much. That made my day. Hope you all are still doing well. It is great seeing these posts. Keep ‘em coming. Yes we’re hanging in there. Hope you’re doing well, and I’m glad you’re still interested in reading about what I believe is “Necessary and Proper” for our country. Be safe and happy, man. Just stopping by and reading your post very nice .I will return again.